When you are running a network for a company, delivery speed is vitally important. Not only do you need to make sure that you have good response times, but you need to ensure that the speed of the network is adequate on every single path that your users’ communications will take. That is a lot of work and testing every path manually will take up all of your time. You need to get a testing tool to ensure that latency does not impair your network’s performance. 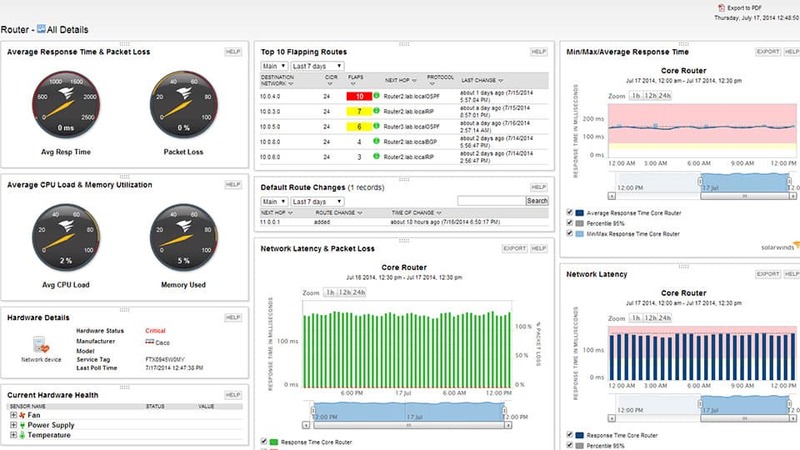 SolarWinds Network Performance Monitor (FREE TRIAL) – A comprehensive network monitoring system that runs on Windows Server. SolarWinds Ping Sweep with Engineer’s Toolset (FREE TRIAL) – A handy ping test utility that is part of a bundle of more than 60 network monitoring tools. Paessler Network Latency Sensors with PRTG (FREE TRIAL) – A network monitor that can report on round-trip time, packet arrival sequence, packet loss, and jitter. Network Pinger – A Ping sweep and Traceroute facility for Windows that shows graphs of your network performance. ManageEngine Free Ping Tool – A free Ping utility for Windows and Linux. PingPlotter – A recursive Ping utility with a graphical output. 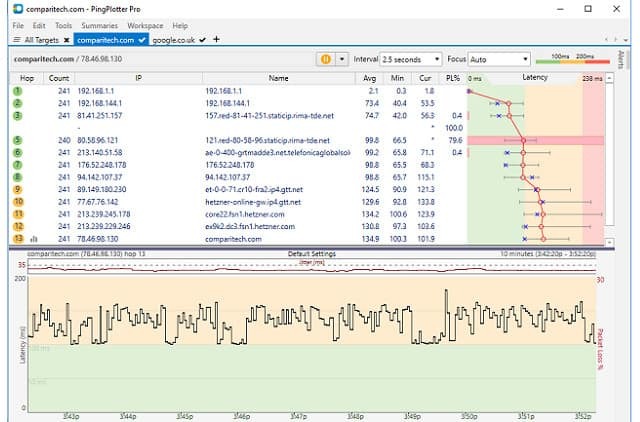 NirSoft NetworkLatencyView – A free tool for Windows that uses Ping to test network performance. 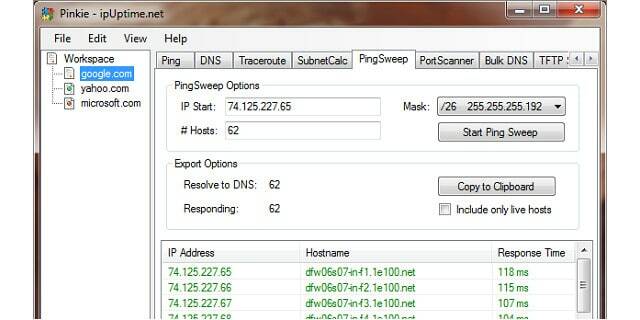 Angry IP Scanner – A free Ping sweep tool for Windows, Linux, and Mac Os. Pinkie – A free tool for Windows that performs a Ping sweep. 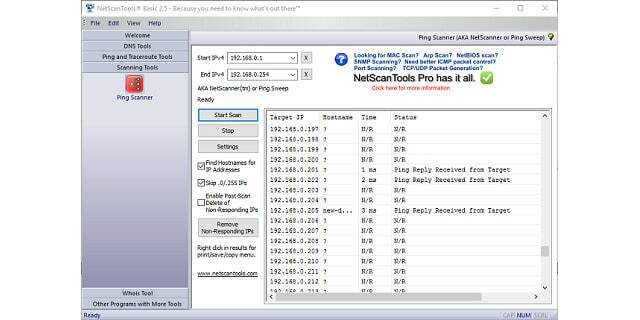 NetScan Tools – This is a Ping-based network performance tool for Windows. Latency is the speed of traffic on your network. As such, you can’t really speak in terms of ‘good’ or ‘bad’ latency. Acceptable transfer times vary according to the application being used. Video playback and interactive VoIP calls need faster speeds than email delivery. So, you need to work out what speeds you need for your network traffic in terms of the services you provide to your users. Latency is always expressed in milliseconds (ms). However, there are two metrics that express latency. Whichever you choose to use for the tests on your network, try to keep all records in the same test category. The most common measure of latency is called ‘round trip time’ (RTT). As the name suggests, this is the time it takes for a packet to get from one point on the network to another. The alternative measurement is called ‘time to first byte’ (TTFB). This records the time difference between the moment the first part of a packet left one point on the network and the time that it arrived at the destination. RTT is used more frequently than TTFB because it can be run from one location and doesn’t require special data collection software to be installed on the remote destination. Every network-connected computer has a free latency testing tool built into the operating system, which is called Ping. This facility works on the Internet Layer protocol, the Internet Control Message Protocol (ICMP). Every network administrator uses Ping and it is a useful tool for a quick check. You don’t need to install any software on the remote computer and you get a report back to the computer from which you launch the command. A typical Ping execution will send 32 bytes of data to a given destination and record the time that a response arrived back. The latency is expressed as the round trip time that includes both the transfer time for the test packet and the response packet. That time is shown in milliseconds. You don’t have to know the destination IP address if you are testing the RTT to a website because Ping will accept the domain name as an address instead of the actual IP address. By default, Ping will send out four test packets, but an option on the command enables you to specify a different number of tests. The results of the Ping command shows the RTT for each test and then summarizes the results. You will see the number of packets sent, the number of responses received, and the number of packets that were lost. You will also see the lost packet tally expressed as a percentage of all tests made. A second summary line shows you the minimum, maximum, and average round trip time for the test batch. Ping is great for a quick investigation when a specific path seems to be running slow. However, the tool isn’t going to help you fix latency problems and it doesn’t allow you to check multiple paths with one command. Fortunately, a number of more sophisticated Ping-based tools are available. These usually enable you to test multiple paths from the same console. You can also often run a Ping test continually with some tools. 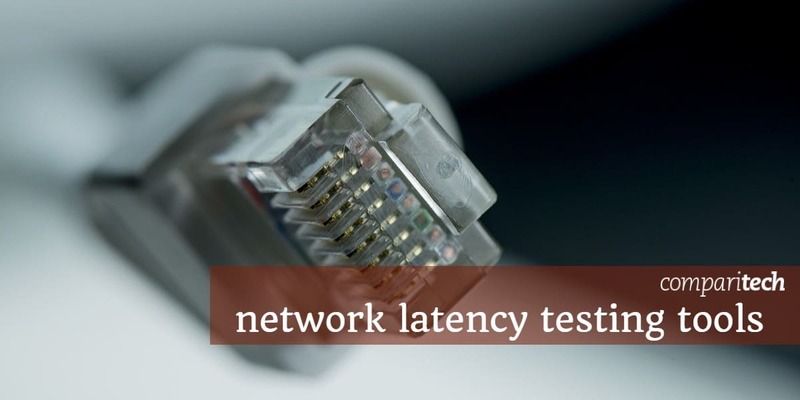 These constant Ping tools give a live display on the results of the latency test. Latency is a complicated issue that can be managed through traffic shaping methods, such as queuing algorithms. You can prioritize some traffic with a range of ‘quality of service’ (QoS) methodologies. These enable you to get time-sensitive application traffic through all network devices ahead of all other traffic. This is great if you provide live video delivery of IP telephony apps on your network. Giving some traffic a clear run through the switches and routers on your network can cause other traffic types to get held up. However, a few minutes of delay in the transfer of an email is a price worth paying if it saves you having to replace your network cable to provide enough bandwidth for all of your traffic to get through at top speed. There are some great latency testing tools out there. Many will enable you to test other network conditions as well. For example, jitter is a measure of the variation of the arrival rate of packets in a stream. An irregular pace in the arrival of packets can cause just as many service problems with video streaming and IP telephony as slow delivery. Another useful metric is the available bandwidth on each stretch of your network – you should keep track of the potential capacity, the median utilization, and the maximum utilization of those links. This information will enable you to plan for capacity requirements when your business managers ask for new software to run over the network, or to add on new endpoints for increases in staff levels. SolarWinds produces an excellent range of infrastructure monitoring tools and its core module is the Network Performance Monitor. All of SolarWinds’s system management systems are written on a common platform, so they can all interact to create a total management system. This monitoring tool is able to keep check on all of your network devices. Most of the monitoring system is informed by the SNMP messaging system. This enables devices to notify the central controller of any performance issues. 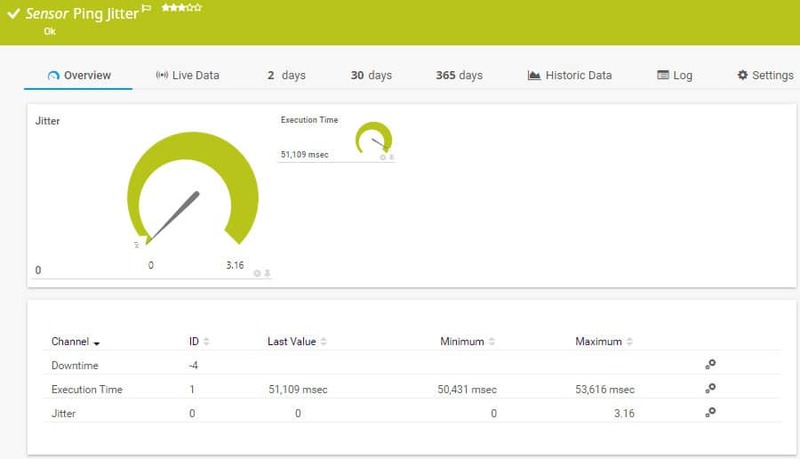 The Network Performance Monitor includes latency testing facilities in the Quality of Experience dashboard. This shows network response times and network latency. The benefit of buying in a complete monitoring system rather than just a latency test utility is that the discovery of slow segments is just the first task – you then have to fix the problem. Data gathered by the Network Performance monitor will help you work out exactly what is causing traffic to be delivered slowly. You can spot which network devices are experiencing errors and which are overloaded. You will also be able to get information that Ping can’t tell about why your users are experiencing poor response times. Imagine if you get complaints of slow performance at the Help Desk but your Ping test shows no problem. 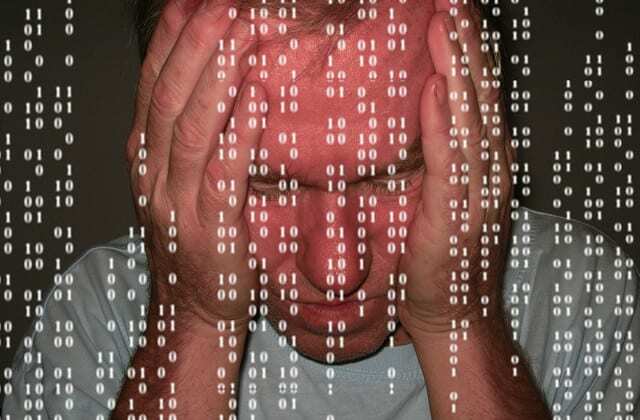 Slow software delivery is not always the fault of the network. With a full performance monitor, you will be able to identify bottlenecks on paths, congestion on ports, and overloaded CPUs on servers. If you opt for the SolarWinds Network Bandwidth Analyzer Pack, you can enhance your traffic monitoring capabilities. In this pack, you get the SolarWinds NetFlow Traffic Analyzer as well as the Network Performance Manager. This tool increases information on network activities by examining traffic volumes between network devices. All of these SolarWinds products install on Windows Server. You can get a 30-day free trial of the Network Performance Monitor, the NetFlow Traffic Analyzer and the Network Bandwidth Analyzer Pack. For a free network testing tool, give the SolarWinds Flow Tool Bundle a try. This set of tools uses NetFlow v5, which was invented by Cisco Systems. NetFlow captures packet headers as they pass through the router and the system is also capable of compiling aggregated summaries of traffic data directly in the router. Once you have captured passing packet headers, you can run them through the network again to get a replay of actual events and see how your equipment performance influenced latency. Another feature in the tool pack will generate extra traffic for you so you can test network performance and latency by adding on services or endpoints. An alternative SolarWinds package of network tools is the Engineer’s Toolset. This bundle of more than 60 utilities includes just about every tool you will need to monitor and manage your network, and the SolarWinds Ping Sweep is part of the bundle. The Ping Sweep tool, together with the SolarWinds Traceroute, was the first tool produced by the company. So, this is the original SolarWinds network monitoring tool. The Ping Sweep tool is marketed as a utility for IP address management on networks. However, the output of the tool displays the round trip time of every address encountered during the sweep, making it an ideal latency testing tool. The tool has a GUI interface. You enter an IP address range to start a sweep. Every address that lies in the given range is then listed in the output. You can choose to exclude addresses that are found to not be in use. You can also search a non-consecutive list of addresses by loading them into the tool in a file. As well as giving you the response times, this is a great tool for tidying up your DHCP address pool and returning abandoned addresses to make them available again. Sweep results can be exported to XML, CSV, or text files. The Ping Sweep installs on Windows Server. You can get a 14-day free trial of the entire Engineer’s Toolset. Paessler PRTG is a comprehensive infrastructure monitoring tool. It covers networks, servers, and applications. The PRTG system is composed of a large number of utilities, which are called ‘sensors.’ Each sensor monitors a piece of hardware, a system condition, or a service. One of the sensors available in the PRTG package is a Ping Jitter Sensor. This tool is included in order to create checks on network device availability, but it also gives you the round trip time of packets to those destinations. The PRTG package includes a couple of other sensors that will give you some great latency measurements. These are the Cisco IP SLA sensors. The information this sensor gives you all relate to factors that can damage the quality of VoIP connections. These factors include round-trip time, packet arrival sequence, packet loss, and jitter. Another latency measuring option in PRTG is the QoS sensor. This is actually two sensors. One gives you the round trip time of packets and the other is a one-way latency, so this is one of the few tools available to give the time to the first-byte metric. Every customer gets the full PRTG software package. The pricing model for the system depends on the number of sensors that the customer turns on. If you only activate up to 100 sensors, you can use the system for free. Paessler offers a 30-day free trial of PRTG with unlimited sensors. Network Pinger is a free tool that runs on Windows. This simple utility has a great-looking interface that is taken up mainly by a display panel for the results of your sweep. That output is a recursive Ping. 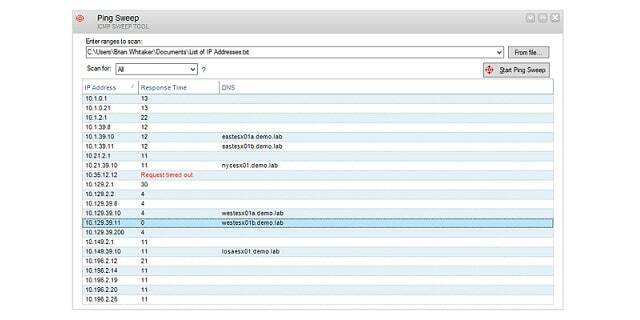 It will test all destination IP addresses that lie within the range that you enter as a parameter of the search. Side panels show graphical representations of the data collected by the sweep. These include a pie chart of contact status and a line graph that shows response times. You also get to see the RTT (Round Trip Time) for each contact attempt. As well as a Ping function, Network Pinger includes a Traceroute facility that will give you the response times of each hop in a link to a given destination address. The tool also has a switch port mapper. You can contact remote computers through the tool by using the built-in Remote Desktop, SSH, Telnet, and Rlogin utilities. This great ManageEngine utility is actually a Ping and Traceroute tool. The free package also includes a DNS Lookup feature and a specialist measure of response times for websites. The Ping section of this tool shows each of the given hosts and the Ping data for each, including the round trip time. The screen will keep refreshing giving you live updates on the RTTs to your list of IP addresses. One problem with the tool is that you have to enter each address individually rather than by entering an address range. However, once you have those entered in the screen, they will stay there even when you have to stop the monitor to switch to other utilities. The Ping results can also be shown on a time series line graph. The Traceroute utility shows you the round trip time on each hop of a route to a given destination and shows a bar alongside. This makes that RTT easy to understand, highlighting the hops that took the longest to cross. The DNS lookup utility will refer to your local network DNS server, or the closest internet-based server if no local records exist for the URLs that you enter. You can enter either an IP address or a URL as the search term for this utility. The Web Response tab gives you a nice graph of the response time to the Web server for a given website address. This graph will continue to update and it shows you the RTT broken down between TCP session establishment, redirection time, and web page response time. This is a great little tool and you can also get reports printed from it in PDF format, which you can save or email. PingPlotter is available in three editions: Free, Standard, and Professional. The free version is actually a 14-day free trial of the Professional edition. All versions of the tool implement Ping and Traceroute, giving results of both tests in graphical format. The console for the tool has a tabbed display panel, much like a Web browser. For each target, you start a new tab, which shows a list of the hops between your computer and the destination. Tests keep running live and accumulated results for the latency on each hop is shown in three data columns. These show the average, minimum, and current round-trip times for that hop. A visualization column at the end of each row plots the minimum, maximum, and average RTT on a line. A vertical line graph runs along all of the records in the display which plots the current RTT for all hops. A lower panel in the main screen shows both the latency and jitter for the current connection over time. A summary tab shows you latency results for all currently open connections in the test system. This is a great tool that will install on Windows, iOS, and Mac OS. The free version only stores the history for 10 minutes, but the two paid versions show data over an unlimited time frame. The paid versions also include an alerting system and you can choose to run TCP or UDP Ping tests – only ICMP Ping is available with the free edition. The NetworkLatencyView tool from NirSoft is a little different than all of the other latency testers on this list. Rather than examining links to a given destination, the utility listens for all new TCP connections and monitors while they persist. The reports of the tool are based on Ping, so you will get the same latency feedback that the other tools will give you. This is a free tool and it installs on Windows. The display window can show up to 10 Ping test RTT values for each detected connection. It also shows the average of those ten tests. This makes the display area very wide. However, you can resize columns, stretch the window, or scroll to the right in order to see all of the data. Results can be saved to CSV, HTML, XML, tab delimited, or text file for analysis in other apps. 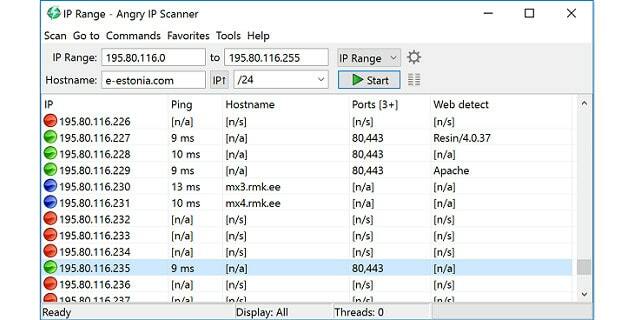 Angry IP scanner is a free Ping utility that will run on Windows, Linux, and Mac OS. The straightforward layout of the interface makes this a useful tool for busy system administrators. You can start a Ping sweep either by entering ‘from’ and ‘to’ IP addresses or by entering a hostname and a CIDR notation offset. It is also possible to enter a non-consecutive list of IP addresses by loading them into the interface from a file. The tool will ping every address within the given range and show each in the output. This can result in a lot of unused addresses appearing in the screen. You can avoid this large number of irrelevant records by setting in the Preferences section of the tool that only live IP addresses should be shown. This requirement can be refined further by an option that limits the output list to show just those hosts that have open ports. Tests can be carried out with the classic ICMP message, with TCP, or with UDP. Although the utility will ping many hosts in one run, it will only run each Ping probe on demand. The service does not repeat continuously. If you want to refresh the report, you will need to push the Start button again. The default output only shows the average RTT for each discovered IP address along with the hostname of that destination and the number of open ports on that device. You can customize the output screen by selecting extra data categories. These include a Packet Loss field. The number of tests issued is dictated by one of the settings in the Preferences screen. The default number of probes is three per address. The output of a test can be exported in CSV, XML, text or IP-Port format. Pinkie is a suite of network monitoring tools that includes a Ping sweep option. The tool is free to use and will run on Windows. The tool also includes a straightforward Ping option, which will probe just one destination IP address, which can also be entered as a URL. This feature will continue to issue Ping packets to the target, showing the RTT and also the ‘time to live’ setting entered in each probe packet. The Ping Sweep option will test a range of addresses. However, the test is not continuous and you have to launch the utility again by pressing a Start Ping Sweep button to get the results refreshed. A checkbox in the search section of the screen enables you to exclude IP addresses that are not live. The results in this screen show the IP address, the hostname, and the RTT of that probe. The Ping Sweep output can be copied to the clipboard and then pasted into a text file. Other utilities in Pinkie are a port scanner, a Traceroute implementation, a DNS lookup function, and a bulk DNS reference facility, which uses a list of addresses from a file. There is also a subnet calculator and a TFTP server in the bundle. This is a very useful pack of tools that help you keep all of the facilities you need to check on your network in one interface. NetScan Tools Basic Edition is a free set of network testing tools that runs on Windows. The tool is free because it is supported by advertisements. If you want to get rid of those ads, you can buy NetScan Tools Pro. You get three Ping-based utilities in both editions of NetScan Tools. The package also includes a Traceroute facility, so you have four ways to test the latency of your network. The first of your Ping options is a straightforward graphical interpretation of the standard command. You enter a domain name, a hostname, or an IP address and the tool will send out five Ping probes to that destination. The output will show the RTT and time to live of each probe. You can alter the number of packets sent in each run in the Settings menu. A Graphical Ping option shows a constantly-executed Ping test to a single destination. Again, that target can be specified by hostname, domain name, or IP address. The test will keep repeating until you choose to stop it – even continuing when you move away from this screen to try a different utility. The line of the graph shows the RTT of each attempt. A Ping Scanner lets you test a range of IP addresses. The output will show the results of a Ping test to every address within the given range. However, you can select to cut out non-responding addresses. The results include the IP address, the hostname, the round trip time, and a status report for each address in the range. A context menu in this screen is available when you click on the right mouse button. This enables you to print the output of the test or save it to a file. 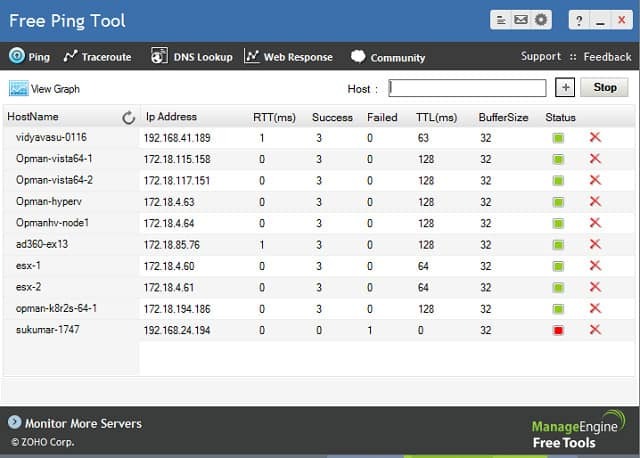 The Traceroute tool gives you another view on your network latency. This shows every hop between your computer and a given destination address. The RTT of each hop is shown alongside the IP and address of each intermediate router. This command will run once. You have to reissue the command if you want to get an update on the speeds of each link in the connection. Other tools in the pack are a DNS lookup feature and a Whois query tool. Although there are many different methods for measuring latency on your network and across the internet, Ping is the most commonly-used utility to test connection speeds. As you can see from our list of options for testing latency, all companies producing network monitoring tools for speed tests make sure to include a Ping tool in their applications. In this guide, you have read about ten alternative tools that will provide you with latency testing facilities. Your first task, when narrowing down this list, is to examine the operating systems that each option will run on and only focus on those that run on the system on which you want to run your monitoring facilities. Fortunately, all of the tools on our list either have a free version, a free trial, or are completely free to use. Many of the tools are very lightweight and don’t take up much disk space, so you can download a few of them to compare their performance. Do you test your network latency frequently? Which tool do you use? Do you rely on the standard command line Ping? Have you tried any of the tools listed in our guide? Leave a message in the Comments section below and share your experience with the community.